Understand the difference in each plan. We offer different plans to suit the needs of any size business and organization. We have plans that are month-to-month. These plans are billed to your credit card once each month. And you can cancel anytime you want. Need something much bigger? Give us a jingle at 1-866-611-3050 and let's talk. Get started with your Free plan. We also offer Annual Plans. These are plans where you pay for the entire year up front. You are only charged one time a year. By going with our Annual Plan we will give you 20% more messages per month. "What are the differences between the plans?" The differences is just the amount of text messages that you get to send. And the number of Keywords the come with each plan. Other then that, all the plans come with the exact same features. "Can I upgrade and downgrade my plan at anytime?" This one you want to be careful with. Because you can always upgrade your plan at anytime, but you can't downgrade. Choose the plan that works for you on day one, and then just upgrade to the next plan when you feel you are ready. "What if I just need more messages and more Keywords?" No worries, we got you covered. 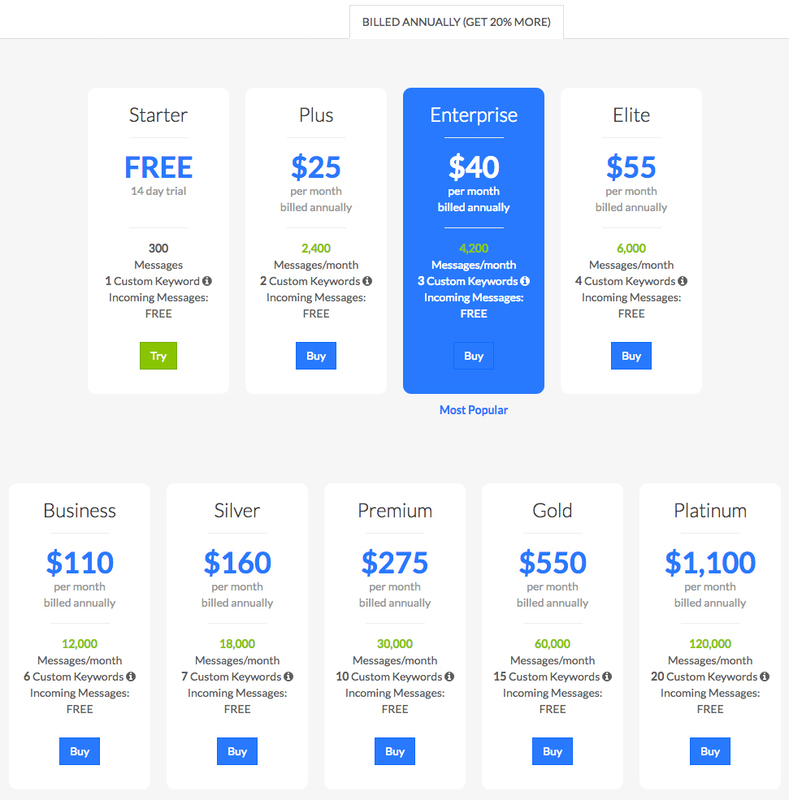 With any of the plans you can always just purchase more messages and more Keywords at anytime without having to upgrade. You can purchase extra messages in blocks of 500. This is a one-time cost of $10 for each block of 500 messages. You can also purchase as many Keywords as you like. 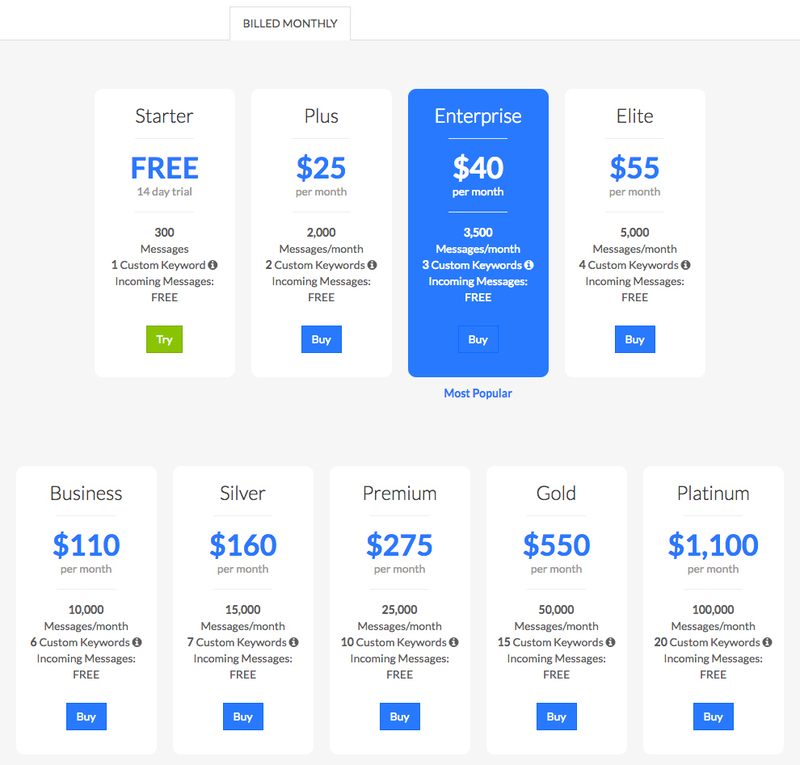 Extra Keywords are $5 per month. "Can I cancel at anytime?" Yes. All Monthly plans are month-to-month. We do not lock you into any long term contracts. "Can I freeze my account?" We cannot freeze your account. If you decide Textedly is not for you, you might need to just cancel the account. "How do I cancel my account?" You would need to log into your Textedly account. Under "My Account" in the top right corner, there will be a drop down button that says Account Settings. Go to that page, and there you will see a Cancel My Plan button. Click on that. Please note, that by canceling, all your data will be deleted. "Where can I find my Billing History?" You would need to log into your Textedly account. Under "My Account" in the top right corner, there will be a drop down button that says Payments. Click on that and you will see all your Billing History.